The Blocker Tie-Ring is a unique way to tie a horse securely yet safely. A superb tool for youngsters and for re-training horses who pull back and panic when tied. The Blocker Tie Ring comes with detailed instructions and is easy to assemble and use. It can be fixed anywhere, stable, yard, fence, lorry etc. Ideal for single use or cross tying. The Carabina fastening gives safe and easy quick release for falls or emergencies. Adjustable resistance levels. The Blocker Tie Ring has changed the way people tie their horses, providing a safe, humane way to tie your horse. 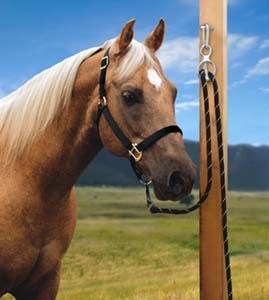 Designed to be a support system rather than a restraint system, the Tie Ring allows a horse to pull slack in the lead rope when he panics or falls. This releases pressure and the source of pain or panic, dramatically reducing the threat of injury to you and your horse. Now the next generation of tie ring, the Blocker Tie RingII with Mag-Loc, improves upon the original. The Mag-Loc feature holds the tongue in place, making the tie ring more stable so it can be mounted at any height. In addition to cross ties, single ties, grooming and tack areas, trailers, high lines and picket lines, you can now mount the Tie Ring II on hitch rails. This stays on either side of the tongue preventing the tongue from sliding around the ring so your horse can safely pull slack from any angle. The new specially designed Quick Snap makes theTie Ring II even easier to move from location to location. You can take your horse away from home knowing he can be safely tied just about anywhere. 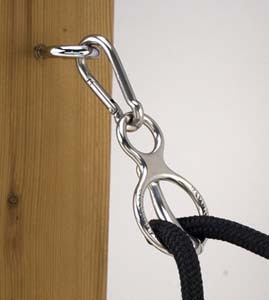 The Blocker Tie Ring II–simply the safest way to tie your horse.